Send music and calls through your car speakers with the Scosche BTFreq Wireless Hands-Free Car Kit. 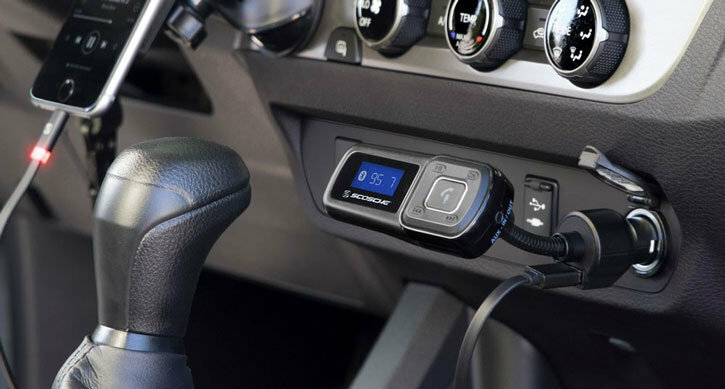 Featuring an FM transmitter to transmit your phone's audio to your car and an integrated USB charging port, as well as a built-in mic for hands-free calls. Fed up of only having a single CD in your car? Wish you could have a larger selection of tracks at your fingertips that could be played through your in-car stereo system? Introducing the Scosche BTFreq. 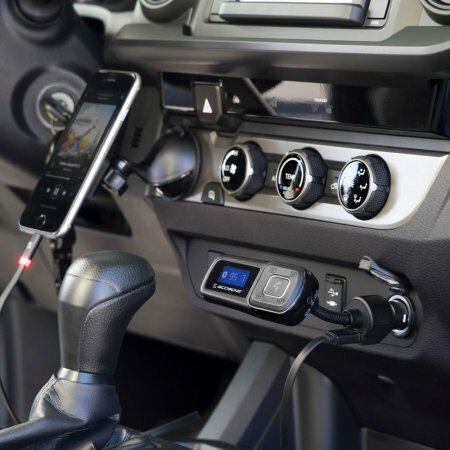 This is an FM transmitter that transforms your smartphone or tablet into an FM Transmitter, so you can enjoy a wide range of music heard through your car's much louder and clearer speakers. Listen to your music, podcasts or audiobooks in style using the Scosche BTFreq. No wires, no installation and no mess! Your smartphone or tablet speakers are very small and although have become more impressive over the years, they could never compete with the size and quality of an in-car stereo speaker system. The Scosche BTFreq sends audio through to your car speakers using your FM radio. Simply tune your car radio to a clear FM frequency and then select the same exact frequency on the BTFreq. 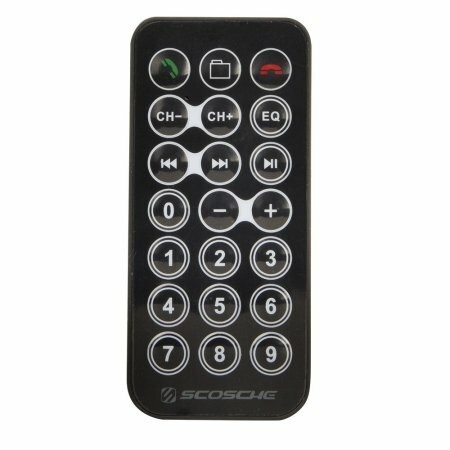 With the built-in microphone and Bluetooth capabilities, the Scosche BTFreq allows you to make and receive phone calls - providing a hands-free solution for your conversations when in the car for your safety and convenience. Don't risk losing control of the steering wheel or breaking the law by holding a phone up to your ear, instead using the BTFreq to make and receive calls - all through your car's stereo system. The crystal-clear built-in LCD display on the Scosche BTFreq Transmitter simplifies the setup process, allowing you to easily and clearly see what frequency you're tuned into. What's more, the BTFreq FM transmitter features built-in controls which not only control your tracks, but your calls too. Using your existing USB charging cables, you can plug your USB charging compatible device into the BTFreq FM Transmitter for extra juice. Never be without power, so you can make that important phone call or for power intensive location apps including using your phone as a sat nav. With 2.1A power output, your phones will charge quickly. This port is even powerful enough to charge tablets. An absolutely enormous amount of devices support the use of headphones and it is this same 3.5mm port that you can use to plug into the Scosche BTFreq Car Kit. Use your smartphone, tablet, sat nav or other music playback device to send music to the BTFreq, which will then be sent to your car's stereo system. 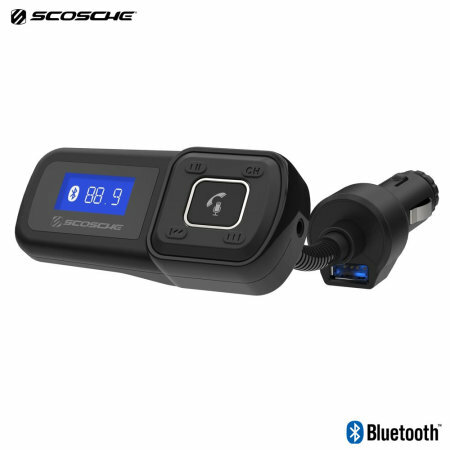 With music streaming services becoming more and more popular, you are able to play your music through the Scosche BTFreq Car Kit even when using Spotify, YouTube, Pandora, Deezer and other audio services.